Genuine Tajima part designed to clamp pocket fronts for embroidering on finished shirts. 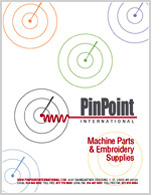 The lever compression is fast and easy to operate and holds the material securely for embroidery. The Tajima Pocket Clamp can also be used on shirt cuffs, collars, gloves, socks and any item with hard to reach and limited embroidery space.